Very rarely do I comment on celebrity gossip, even though celebrities fascinate me. I figure there are plenty of other sites out there that do a much better job than I would, so I leave it to them. But I can’t resist sharing this article. The author of the article claims that after Matthew McConaughey and Penelope Cruz split up, he flew down to Costa Rica for some partyin’ as a way to take his mind off of the split-up. Just look at that photo. That’s the face of a man who knows how to party. I often wonder how a person manages to come to terms with all the baggage that comes with becoming a celebrity. Some people just seem to crumple underneath the emotional weight of it (Dave Chappelle) and some seem to have been born for the role (George Clooney). And then you have guys like McConaughey, who for all the world seem to act like they work part-time as a convenience store cashier rather than as an international celebrity (Kiefer Sutherland also springs to mind). I have conflicted feelings about McConaughey. Since both of us are from Texas I’m kind of embarrassed that he goes around acting like such a piece of trash. Part of me would like a much better representative. But, honestly, I know guys that act like him. You remember that time McConaughey got arrested for playing bongos naked in the middle of the night after smoking a prodigious amount of dope? That’s a walk in the park compared to some of the stories I could tell you. I know a guy who picked mushrooms off of cowshit, boiled them up, and ate them in his spagetti because we told him the mushrooms contained psylocybin. McConaughey also has a brother named “Rooster,” which I find hysterical. I know a guy who’s legal name is “Peanut,” and there used to be an old man who lived in my hometown that we called “Weedeater.” I don’t think anyone actually knew his real name. 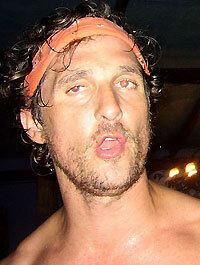 And according to IMDB, Matthew has a nephew named “Miller Lyte McConaughey.” And yes, that’d be Rooster’s boy. I had a friend who wanted to name his son “Skully” because of the size of the kid’s head (the baby’s momma wouldn’t let him). As much as I resent the fact that McConaughey portrays young Texan males as frat-boy-beer-drinkers-and-hell-raisers, I must admit that the representation is actually fairly accurate.